A local sheriff said that children are among the dead. 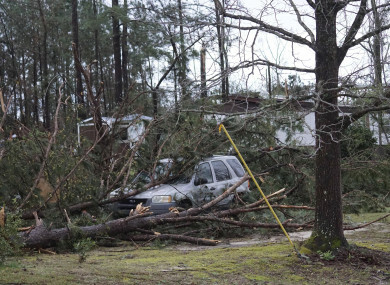 A vehicle is caught under trees in Beauregard, Alabama following a tornado on Sunday night. AT LEAST 23 people have been killed after two tornadoes swept through the US state of Alabama on Sunday. The storms caused catastrophic damage to buildings and roads, leaving more than 20,000 homes in Alabama and neighbouring Georgia without power and a number of people missing. Images showed trees snapped in two, debris-strewn roads and wrecked houses left in the wake of the tornadoes, estimated to be half a kilometre in width. Authorities have warned that the death toll could rise as rescuers search through the debris. Search operations for those still missing had to stop due to hazardous conditions on Sunday night, but a local sheriff said they were expected to resume this morning. “Unfortunately our toll, as far as fatalities, does stand at 23 at the current time,” sheriff Jay Jones told reporters, acknowledging that children were among the dead. US President Donald Trump later expressed his condolences to those who had been affected by the tragedy. “To the great people of Alabama and surrounding areas: Please be careful and safe,” he wrote on Twitter. While Jones referred to a single storm, CNN reported that two tornadoes had hit Lee County in quick succession, some of “at least a dozen” it said tore through Alabama and the neighboring state of Georgia on Sunday. The National Weather Service suggested that there were multiple twisters in the area, reporting that the first tornado was at least an EF-3 – meaning it had wind speeds of 218 to 266 kilometres per hour. Email “'The devastation is incredible': At least 23 killed after tornadoes sweep through Alabama”. Feedback on “'The devastation is incredible': At least 23 killed after tornadoes sweep through Alabama”.